Known as 'God's Own Country', Kerala is a relaxing contrast to other Indian states. This trip takes you to see tea and spice plantations, learn about colonial influences in Kochi, includes a stay on a local houseboat and an extension to your trip at a relaxing beach in Kovalam. Our tour begins this afternoon in the coastal city of Kochi (Cochin). Kochi has been a gathering place of merchants since antiquity and is full of bustling traders. The Fort Kochi area is the oldest European settlement in India (1500) and has a mixture of English, Dutch and Portuguese influence including the Mattancherry Palace which was built by the Portuguese in the 16th century. Extensive renovations by the Dutch some hundred years later earned it the name the Dutch Palace. It houses some of the best murals in India, depicting scenes from the Ramayana and other great legends. On our tour around the city by boat and on foot, we also visit the Jew town synagogue where Kochi's surviving Jewish community come to worship. Nearby are the famous cantilevered Chinese Fishing nets, and in the early evening we see a performance of Kathakali, which is thought by some to be the very essence of the culture of Kerala. Its origins may have come from traditional temple rituals and from an art form known as Koodiyattam. It is the face make up which makes this dancing so unique and the dancers can take up to three hours painting their faces - the features are heavily emphasised as it is the facial expressions and co-ordinated eye movements which are important in the dance. The dances usually portray events from the Ramayana and Mahabharata, great Indian epics. This morning we have a drive to Munnar of around 5 hours through an area of spice and tea plantations. Kerala has been renowned for its spices for at least 2000 years, the coast had been known by the Phoenicians, Romans, Arabs and Chinese for its sandalwood and spices. There was also a flourishing trade in 'black gold' - pepper - which, along with the spices, was sent to Europe by the Jewish and Arab traders. In return, copper, brass and gold coins came to Kerala. It was this trading link which brought Christianity and Islam into Kerala - the first place in India to host these two faiths. Munnar is a pleasant place to spend time, with its green tropical forests, fresh mountain air and neat tea plantations. It is hardly surprising it has become a favourite for Indian honeymooners. The afternoon is free to explore this beautiful town. Our day starts with a fascinating visit to a tea museum where we can learn how it is processed. It is the women who usually pick the tea because of their nimble fingers, their brightly coloured clothes contrast sharply with the greenery of the plantations. Leaving the tea museum, we drive for around 4 hours to Thekkady where we'll take a nature walk through delightful countryside and visit a spice garden, learning about how the spices are grown and processed. Our route this morning takes us past rubber plantations and varied spice gardens to Periyar wildlife sanctuary, close to the border with Tamil Nadu. One of 16 tiger reserves in India, Periyar is it is perhaps better known for its elephants. There are about 40 tigers living in the 777 sq km park but, as they are solitary creatures, the chances of seeing them are very slim. We go for a walk in search of other wildlife such as the wild boar, giant malabar, porcupine and the flying squirrel. The Park itself is made up of a variety of habitats, open grasslands, deciduous, semi-evergreen and tropical forests all of which have different animal species. The ecosystem of the tropical evergreen jungle is very interesting as the trees grow up to 40m, and the dense canopy only allows in limited sunlight. Therefore at ground level, there are abundant ferns, orchid and airplants- plants which need little light to survive. Leaving the park we head back towards the coast and our homestay for the next two nights. We stay with local families within a village, and your tour leader will brief you on local customs and traditions. It is a great opportunity to spend time learning about the real life of Keralans as well as an opportunity to sample some delicious home cooking - perhaps a spicy coconut curry. The rooms are in the same style as a traditional Keralan home with mattresses made locally using coir fibres, a material taken from coconut husks which allows air to flow naturally - ideal in this humid region. All rooms are twin share and the majority of them have their own attached bathrooms, although there are some rooms with a private bathroom located in a corridor next to the room. Bathrooms are basic with a toilet and a simple shower, and hot water can be limited at times. All bedding and towels are provided. We spend today exploring the village and getting to know our host families. There will be a chance to take a cooking lesson, take gentle walks through the surrounding villages or just kick back and relax for the day. 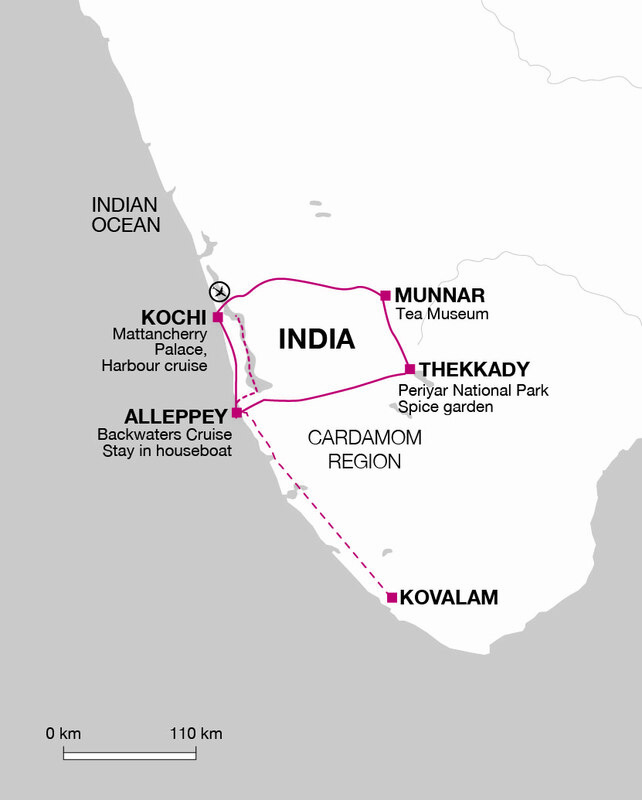 This morning we board our houseboats and begin our journey into the network of the Kerala backwaters. The traditional houseboats are simple vessels, with en-suite twin rooms. The pace is relaxed - enabling us to see riverside village life in its entirety. The industrious villagers survive on narrow spits of land, keeping cows, chickens and cultivating vegetable gardens. Even the shells from the fresh water mussels are burnt to make building lime, and the fibre from the coconut palm has many uses including coir products made from coconut fibre. The gardens are generally well tended often with brightly coloured flowers, such as hibiscus, contrasting sharply with the tropical greenery. After a relaxed breakfast we disembark from our houseboats and return to Kochi where the rest of the day is left free for personal exploration. After breakfast this morning we take a short transfer to Ernakulam train station where we board the Kerala Express train to Trivandrum. The journey will take a little over four hours and we travel in air-conditioned carriages (subject to availability). On arrival a short transfer is provided to the hotel, our base for the next two nights just outside Kovalam. We are not travelling with an Explore Leader while in Kovalam, time is left free to relax on the beach or explore the nearby town. Today is again left free for you to do as you wish. There is the option to book an excursion to Kanyakumari, the town located on the southern tip of India. The town is named after the godess Devi Kanya Kumari, the sister of Krishna, and as such is a popular site for pilgrims to visit and take a dip in the ocean. Alternatively you can take an afternoon tour of Trivandrukm with a local guide taking in the Padmanabha Swamy Temple, Napier Museum and the art gallery. The trip ends this morning after breakfast. Kerala is a tropical region with high humidity. Lightweights are needed all year round with some warmer clothes for the cooler winter evenings (November to March) in Munnar and Periyar. Casual clothes are the most practical: tight fitting garments, brief shorts and skirts should be avoided, since they attract unwelcome attention. A beach towel is also recommended. Walking shoes or trainers are required for the nature walk in Periyar and sandals are recommended for the rest of the trip. One main piece of baggage and a daysac. Remember - hotel porters are not always available, so don't overload yourself. Binoculars, torch, insect repellent and water bottle. Accordingly, you should allow £30 for tipping. Your tour leader will account to you for any organised tipping. This tour will suit anyone looking for a relaxed introduction to south India. It offers a chance to fully experience life in Kerala's beautiful backwaters by spending two nights in a family home. With a slightly more relaxed vibe than India's northern states you can get a taste of Indian culture, and learn a little of the spices and tea that are exported from what is known as Gods own country.